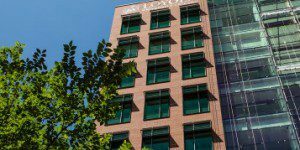 The Loyola University Quinlan School of Business part-time MBA operates on a quarter system, with new students beginning each quarter. Generally, the fall quarter begins in late August, the winter quarter begins in early November, the spring quarter begins in late February and the summer quarter begins in late May. Courses are scheduled during evenings and weekends, which allows part-time students to work during the daytime. Students can dictate the number of courses they enroll in during each 10-week quarter. Quinlan MBA students attend a required orientation session prior to commencing the program. While Loyola University’s full-time and part-time programs operate in conjunction with one another, a part-time course load is considered to be one to two courses per quarter, though full-time status is granted to any student taking two or more classes (six hours or more) per quarter. Students are free to switch between full-time and part-time course loads, but must complete their degree within five years of enrolling at Quinlan. The Loyola University part-time MBA curriculum begins with a prerequisite quantitative methods course. The core curriculum then consists of seven core classes, up to four of which can be waived based on experience or comparable class work. All students then complete a Business Ethics course and a Global Perspective requirement. Students then are able to select five of eight disciplines in which to pursue advanced leadership work: accounting, economics, finance, human resources and employee relations, information systems management, marketing, management, and operations management. The remainder of the curriculum is fulfilled with three or four elective courses and a concluding integrative Capstone Experience. Elective choices allow students to tailor their study among thirteen concentrations. Quinlan’s Business Career Services (BCS) offers students career and job-search related guidance including career counseling, resume feedback, mock interviews and internship and job postings. Additionally, career fairs, school-sponsored networking events and on-campus interviews for many companies are arranged in Maguire Hall, the BCS office’s home. RamblerLink, BCS’s recruiting technology compiles these opportunities in one convenient location for students, connecting them to upcoming events, workshops, interview options and job postings. The cost of the Loyola University part-time MBA at the Quinlan School of Business is currently $4,488 per course. Quinlan offers U.S. citizens and permanent residents the opportunity to apply for loans if they satisfy certain criteria. By filing the Free Application for Federal Student Aid (FAFSA), applicants may become eligible for up to $20,500 per year in FAFSA government loans as domestic students. For the fall term, the priority filing date is March 1. Quinlan graduate students are also able to apply for Graduate PLUS Loans, which come with a fixed 7.9 percent interest rate. Quinlan automatically considers incoming students for the Dean’s Merit Scholarship based on the newly admitted student’s GPA and GMAT scores. This scholarship covers the cost of one or two courses and requires no additional application work on the part of the applicant. Prospective students are invited to apply to any of the four terms. Decisions are generally delivered within two weeks of the receipt of all materials by the admissions office. To apply, you must submit a completed application form, official transcripts, two letters of recommendation, a statement of purpose, official GMAT or GRE scores, and a professional resume. If you apply online, the application fee is waived, otherwise payment of $50 is required to complete the application. International students may be asked to submit TOEFL or IELTS scores if their native language is not English. Furthermore, applicants who completed post-secondary education outside the U.S. are required to submit their transcripts to Educational Credential Evaluators Inc. for evaluation on a course-by-course basis.